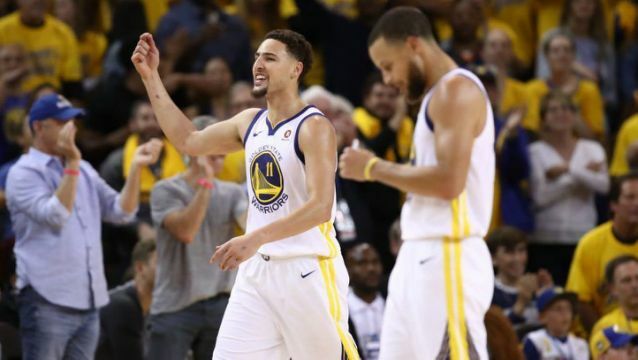 Klay Thompson was the hero for the Golden State Warriors in Game 6 of the NBA Western Conference Finals. OAKLAND—Trailing by 17 points early in Game 6 of the Western Conference Finals, it appeared the dynasty of the Golden State Warriors was crumbling before our eyes. But wait, Klay Thompson nailed 9 three-pointers, the defense was smothering, shutting down the Rockets superb shooting from beyond the arc, as the Warriors pulled away in the second half winning 115-86. The series is all even at 3-3; setting the stage for an epic Game 7 on Monday night from Houston.The winner advances to the NBA Finals. Boston and Cleveland also have a Game 7 on Sunday for the Eastern Conference finals. This is the first time since 1979 both Conference Finals have gone down to the wire. The Rockets were shorthanded missing Point Guard Chris Paul, who pulled a hamstring in the closing seconds of Game 5. The Rockets came out guns ablazing; hitting 11 three-pointers while holding a 10-point lead headed into halftime. DUB Nation turned up the defensive screws by only allowing a paltry 47 points over the final three quarters. While Game 6 savior Klay Thompson was brilliant- 35 points to stave off elimination. While Steph Curry was a magician with the ball, directing traffic while pouring in 29 points. Jordan Bell’s athleticism and energy helped the Warriors immensely. Bell should start in Game 7. James Harden scored 32 points while Eric Gordon poured in 24 points. It is unknown if Chris Paul will be able to play on Monday. This tragic injury to befall CP3 is cruel and unfair. On the doorstep of reaching his first NBA Finals, hopefully, he will be on the court, ready to play when the game tips off. The two greatest words in sports: GAME 7!